Amy from During Quiet Time is one of my favorite blogging friends. She is uber-creative! 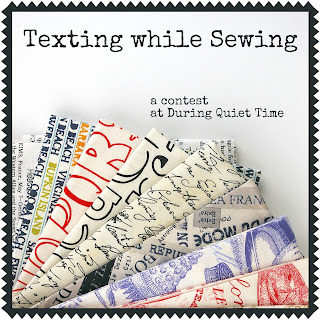 So when she came up with this contest called "Texting While Sewing," I really wanted to enter. It just involved a 12-inch block. How hard could it be? I thought and thought, waiting for inspiration to strike. Nothing. I drummed my fingers on my cutting table. Nothing. And then I had a lightbulb moment when I looked at my bags (and bags....) of selvages. Texting. I was inspired to make a little texting conversation between "me and my sister." Here is their conversation on the iPad. Feel free to do a little eavesdropping. The entries have starting coming in, and will continue through Wednesday. There are lots of fun and creative entries. Whatever the outcome, I had the best time making this block. It would make a great cover for my iPad, don't you think? You know I LOVE this block! Thank you so much for joining in Cindy! It will make the perfect cover for your iPad-perfect! Good luck! I love this block. :) It's so creative!! What a great block! The first time I glanced at it, i really thought that it was your phone! OH my gosh, what a cool text block! Such a clever use of your selvege collection, and clever way to illustrate text on fabric! You know how I feel about his one....IT ROCKS!!! You rock! And yes, I think this will make a great cover for your ipad!!! Your block is great! You should be very proud of it! I love this project, it really makes me smile! This is terrific!! What a creative use of the selvages. This block is so clever and fun!! I love it! So much fun to see selvages used so creatively! Cindy...you are so creative with your selvages! Love it...made me smile! I just love this block and I am still kicking myself that I didn't think of it first! Great use of selvedges. Yes, ou should use it for your ipad. What a fun block!! Love it, and yes, perfect IPad cover! Cute! Which one of you says "you bug me"? Fabuloso, my dear friend. I am amazed that you hold down a full-time job and still get your blogging done, AND play with your grandkids, AND have time to enter clever contests like this (and since I'm going backwards, I already know the outcome, but I won't tell). I think I'm going to bottle your energy, sell it for a million bucks and then we can split the proceeds and give up our full-time work. Oh, and even though I forgot to comment on it when I was there, I was very jealous that you and Mark went up to King's Canyon and had a dinner out. Food just tastes better in a National Park. Dave and I went there on our sixth wedding anniversary, lo these many years ago. So why don't we all just get out of town more often? It really clears the brain, doesn't it?